It’s been made from shells, plastic, copper, linen, and huge rocks. Nowadays it’s often just a number on a screen. It’s both a tool for exchange and an asset in its own right. It’s powerful if we all believe in it, and totally useless if we don’t. 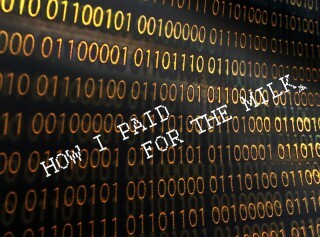 I’m talking about money. Yes, when you think about it, money is one of the weirdest and most incredible inventions in human history. None of us can remember a world without money, so we don’t tend to question it that much. Except maybe to complain about how little we have! Well, a new exhibition at the British Museum in London, called ‘Money Matters’ and supported by Citi wants us to stop and think about this thing that’s become so much a part of our lives, we’ve forgotten to ask where it came from. I went along to take a look and also have a chat to its curator, Mieka Harris. Now that it’s becoming more and more common not to handle cash at all and buy everything online or by card instead, Mieka is passionate about displaying art and artefacts which demonstrate the connection between the things we own and the money we bought them with. 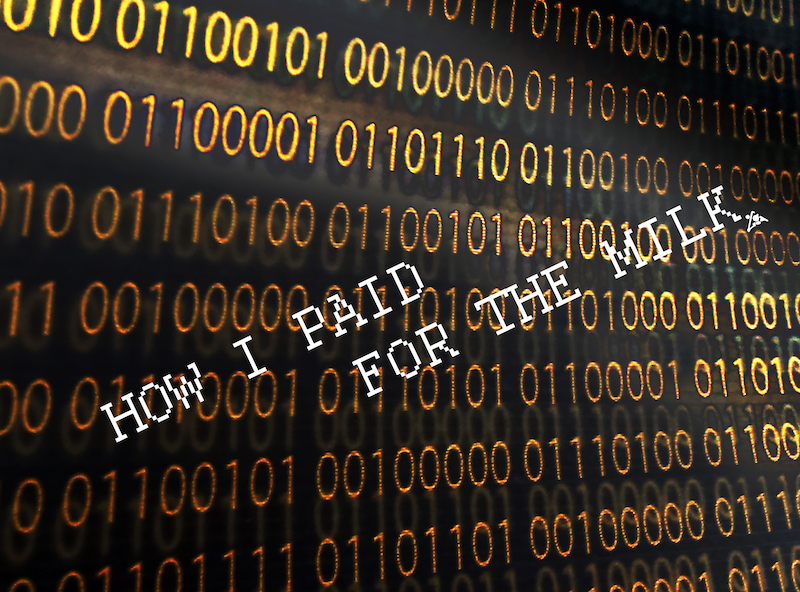 One work, How I Paid for the Milk, by Central St. Martins student Olga Bagaeva, does just that by showing the code behind a digital transaction to make the point that swiping your card is costing you money too, just in a different form: all zeros and ones. But there’s a lot of demystifying to do around what we might think of as more ‘normal’ forms of currency (notes and coins) too. I loved this really powerful collage of Zimbabwean bank notes in the Citi Money Gallery, a permanent exhibition at the museum. 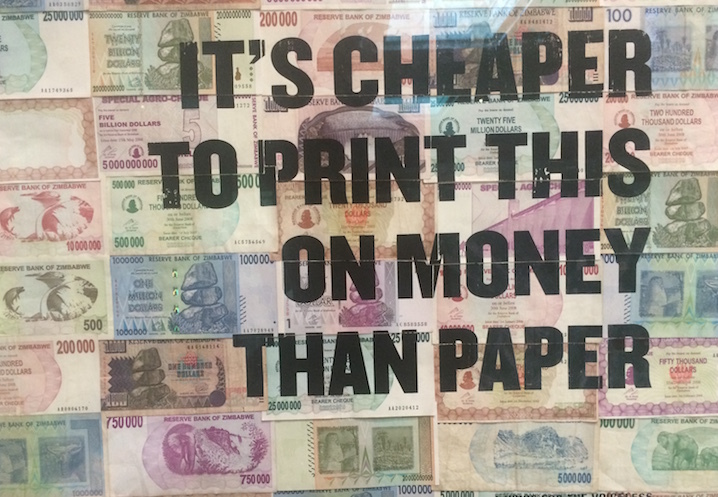 The notes are worth everything from 100,000 to 750,000,000,000, superimposed with the words “It’s cheaper to print on money than paper”. explained to them and realise they’re basically holding the equivalent of a £2 coin, a common reaction is anger. 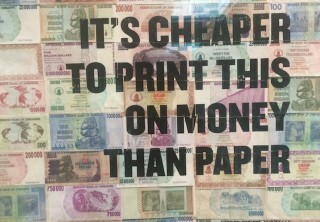 Inflation of the Zimbabwean dollar became so absurd that at one point, 20 billion dollars were worth just two British pounds – the currency has since been abolished as completely worthless, and six other international currencies are now used in the country instead. As well as teasing out the emotional relationship we have with money, the Citi Money Gallery also reminds us that money, politics, and power, are, as Mieka puts it, “intrinsically linked from the word go.” Economics is often presented as value-free, but a bit of digging into the history of money shows how far removed that is from the truth. 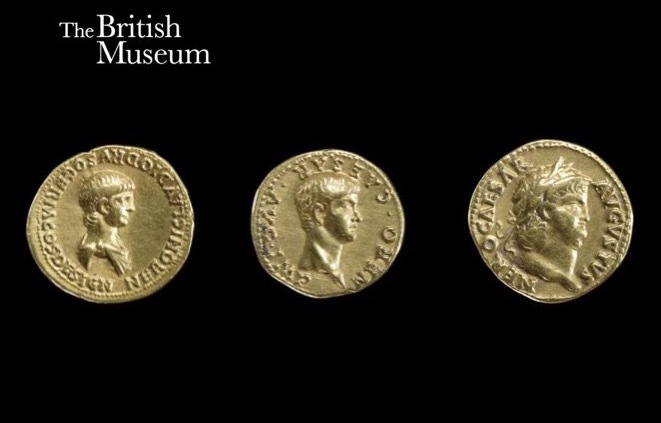 Take the Roman emperor Nero, the first ruler to appear on a coin, instead of a god. He ruled a huge empire and so putting his face on money was a smart way to make sure that people knew who was boss. However, because he was only a teenager when he first came to power, he was worried that his image wouldn’t be authoritative enough. His answer was to have the coins remade every couple of years to show himself getting older, fatter and hairier – a sure-fire way of demonstrating his power! Unfortunately, his plan backfired: a lot of people in the Roman Empire were extremely poor and hungry, and the sight of their emperor getting fatter by the year didn’t go down too well, making him increasingly unpopular among his citizens. Whoops. Many years ago the value of notes and coins was linked to the price of gold. People could swap their money for an equivalent value in gold if they wanted to. The system was abandoned by most countries in the 1930s and, finally, by the US in 1971. Now we just exchange money for other money. And the examples don’t stop there. From coins minted by the suffragette movement in the 1920s saying ‘Votes for Women’, to a copy of The Wizard Of Oz with an explanation of the theory that the famous story is actually about a debate over whether to stick to the US gold standard, the City Money Gallery proves that money is a lot more than just a thing we use to get other things. In fact, it stands for power, politics, culture, and a system that would fall to pieces if we all just decided to stop believing in it. Sounds a lot like the rest of economics to me! Money Matters supported by Citi (Room 69a) and the Citi Money Gallery (Room 68) are on at the British Museum until 9 October 2016. Free entry.